Bri Gaal's Blog: End of January?? It's hard to believe that it's already the end of January. We've had a super mild winter (as most have unless you live in the northwest). No snow at all so far this winter. We don't get a whole lot of snow but every year we've been here we've had at least one storm that shuts down the city and closes the schools. It's been nice so I don't feel so cooped up in the house with baby. Logan is doing great. 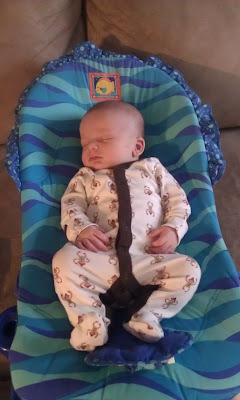 He is eating like crazy this week so maybe he is going through a growth spurt. Yesterday he wouldn't stop crying unless I gave him more food; I kept thinking he couldn't possibly need more but he proved me wrong! At his last weight check he was the 46th percentile (10lbs 4oz) so he's definitely not a big guy or anything, but we can tell he's putting on a bit of chub now. I've now run a handful of times and each time feels better and better. Yesterday I made it out to Umstead with Tassie and felt really good. My endurance is horrible which is no surprise, but I'm just glad I felt like I might be getting back towards actually running as opposed to jogging. I've also swam twice (wow I'm slow) and ridden the trainer once (not only am I slow, but my bum is out of practice sitting on the seat. ow.) So yeah, slowly but surely I'm getting back into the workout scene. Now if only I didn't have to feed the kid all the time I might be able to get out more than 1hr at a time! And he's started smiling...something I've been dying for. 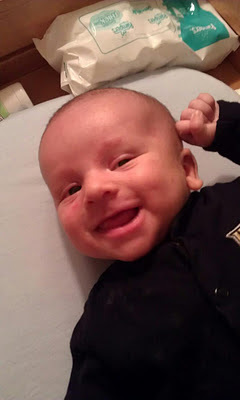 I read that no matter the nationality, pretty much all babies start smiling around 6 weeks old. We got our first ones just a few days shy of his 6 week birthday, and I got a huge one this past Tuesday. A smile to melt your heart!!! What a cutie! Sounds like you are doing great! And isn't it awesome once they start smiling? I'm impressed you got a picture already. Zach was a really happy baby but it took me forever to catch the smile in a picture.